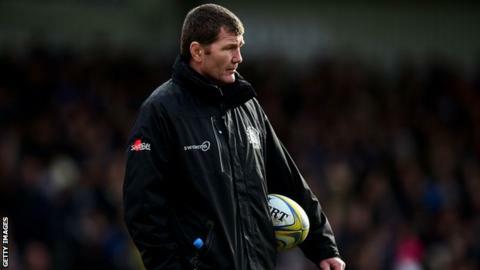 Exeter boss Rob Baxter says his side must be mentally stronger after losing 14-11 to Premiership leaders Saracens. Chiefs had a first-half try disallowed as they lost at home for the first time in more than a year. "I don't think we were quite mentally tough enough to really ram things home," Baxter told BBC Radio Devon. "I think we could have rammed home a win here, but we didn't and we've got to make sure we learn from it and we see it for what it is." Ollie Atkins had a try controversially disallowed in the first half for a knock-on, when replays appeared to show the ball had been knocked back by a Saracens player. Baxter continued: "I want to focus on the things that can make us a great side, I don't want us to focus on 'we'd have beaten Saracens if we'd have had a couple of refereeing decisions'. "I want us to deserve to win because of the great things we do and that's what we've got to make sure we keep fighting to make happen. "I feel a bit sorry for (forwards coach) Rob Hunter, as if you think how many times we gave them line-outs, how many times we gave them scrums, we've got to be a little bit easier on ourselves. "You look at the game as an 80 minutes, we've come up short very late in the game against a very good team. "If that game had been a draw no-one would have complained. If we'd have won by three points no-one could have complained. If we'd have got another try in there from some of our pressure, no-one could have complained." But with Exeter second in the Premiership at the midway point of the season, Baxter says it is important that his side do not dwell on their first home loss since the club went down to Gloucester in January 2015. "Sometimes it's too easy to not see what's actually there," said Baxter. "If someone had said right at the start of this season that you're going to get to the halfway point and you'll have lost three games, and taken bonus points from all of them, most people would take that. "It's a pretty good return and pretty much every other team in the Premiership would take it, so we're going OK.
"What we have to do make sure is that a loss isn't any different to a big win and we're ready to get on with it again."